PRODUCT: Pherd #82166, 4-inch Twisted Knot Wire Wheel with 5/8-11 Arbor, 0.020" Carbon Steel Wire, 3/4" trim, 22 knots, Single Row, 3/8" Face, 20,000 Rpm. Price/Each. DESCRIPTION: A full cable twist knotted wire is efficient for weld spatter removal, blending tool marks, cleaning and deburring, and removal of encrustations. Used in pipe joining for cleaning scale and spatter following welding. Low-flex, high-impact cleaning. OPTIONS: also available in stainless steel, and in 4, 5 and 6" OD sizes. 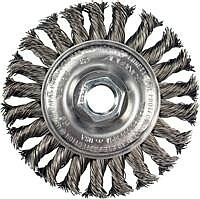 Wire Brush Knot Wheel, Steel Wire 4 x .020, 5/8-11 threaded Arbor. Single-Row 22 Knot, Standard Flag, Regular-Twist Tempered Carbon Steel Wire. Max 20,000 RPM. Price/Each.